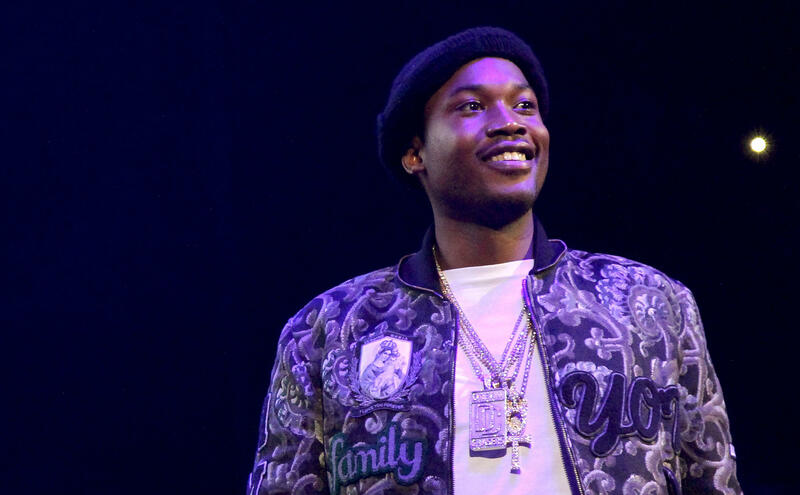 Meek Mill was released from jail Tuesday after the Pennsylvania Supreme Court ordered his immediate release. The state's highest court directed Judge Genece Brinkley, who had previously jailed him, to let the rapper out on "unsecured bail." The 30-year-old, whose real name is Robert Williams, issued a statement thanking his family and public advocates -- who included Philadelphia Mayor Jim Kenney, New England Patriots owner Robert Kraft and rapper Jay-Z -- and said he looks forward to returning to his music career. Michael Rubin, co-owner of the Philadelphia 76ers, posted an Instagram photo with Meek Mill on their way to the 76ers' playoff game. Meek Mill rang the team's ceremonial bell and met with several players in the locker room before tip-off. Rubin has been one of Mill's many supporters and visited him several times in jail. The 76ers beat the Miami Heat, 104-91, to win their series four-games-to-one and advance to the second round of the NBA playoffs for the first time since 2012. The 76ers won a mere 10 games just two seasons ago. Jordan Siev, an attorney representing Mill, said the legalities of his case were more important to the court's final decision than public pressure from supporters. "I don't think the Pennsylvania Supreme Court is going to be fully-swayed by any publicity or celebrities or the public speaking out. I think they look at each case on the facts and on the law. But the truth is, all of the public support and the celebrity support is because this was a complete injustice," Siev told CBSN on Tuesday. Meek Mill issued a statement saying his time in jail had "been a nightmare" but he will now work with his legal team overturn his "unwarranted conviction." "Although I'm blessed to have the resources to fight this unjust situation, I understand that many people of color across the country don't have that luxury and I plan to use my platform to shine a light on those issues," Meek Mill said in a statement before his release Tuesday. "In the meantime, I plan to work closely with my legal team to overturn this unwarranted conviction and look forward to reuniting with my family and resuming my music career." In November, Meek Mill was sentenced to two to four years in prison for violating probation on a nearly decade-old gun and drug case. Judge Genece Brinkley, who sentenced the rapper for the probation violation, said he wasted several chances to clean up his act after the 2009 case. The sentence came against the recommendation of the prosecutor who said Meek Mill had matured since his original crime. Brinkley said the prosecutor did not know the case as well as she did and that the rapper just "does what he wants." Demonstrators took to the streets at the time in protest. Meek Mill was arrested twice in 2017 -- once in St. Louis for an alleged altercation in the airport and another time for alleged reckless driving in New York City involving a dirt bike. Earlier Tuesday, fellow Philadelphian and comedian Kevin Hart was at the jail to visit him, CBS Philadelphia reports. "The frustration for me is, why is he still there? I still don't understand why he's still in jail after so much has been pointed out," Hart told reporters after the visit. "I think the good with the situation is that he now has a platform. And I think coming out, he will be able to use that platform to really shine a light on how corrupt this system is and hopefully also keep this younger generation from going through this. And also, a lot of people that are incarcerated now that are doing unnecessary time." Hart said his relationship with Meek Mill is strong and that he views the rapper as innocent. "When you know that you're innocent, it's tough to sit through something that you know that you didn't do," Hart said. Jay-Z wrote an op-ed in the New York Times in November and called the rapper's sentence "just one example of how our criminal justice system entraps and harasses hundreds of thousands of black people every day." Jay-Z wrote that Meek Mill has been "stalked by a system that considers the slightest infraction a justification for locking him back inside" and said that when he was growing up in Brooklyn in the 1970s and 1980s, he saw that probation became a "landmine" for many. He pointed out that a "random misstep" could bring consequences greater than the crime. "A person on probation can end up in jail over a technical violation like missing a curfew," wrote Jay-Z. He pointed out, "As of 2015, one-third of the 4.65 million Americans who were on some form of parole or probation were black. Black people are sent to prison for probation and parole violations at much higher rates than white people." On Nov. 7, Jay-Z stopped his concert in Dallas to say of Meek Mill, "He caught a charge when he was, like, 19. He's 30 now, he's been on probation for 11 years. F***ing 11 years. Judge gave him two to four years because he got arrested for being on a bike and popping a f***ing wheelie." Gisela Perez and Cassandra Gauthier contributed to this report.